Human PSMA, His Tag (PSA-H52H3) is expressed from human 293 cells (HEK293). It contains AA Lys 44 - Ala 750 (Accession # Q04609-1 ). 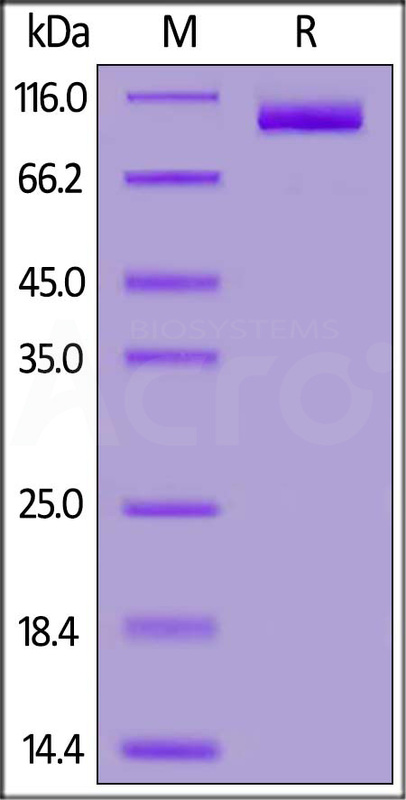 The protein has a calculated MW of 81.4 kDa. The protein migrates as 90-110 kDa under reducing (R) condition (SDS-PAGE) due to glycosylation. Human PSMA, His Tag on SDS-PAGE under reducing (R) condition. The gel was stained overnight with Coomassie Blue. The purity of the protein is greater than 95%. Prostate-specific membrane antigen (PSMA) is also known as Folate hydrolase 1 (FOLH1), Glutamate carboxypeptidase 2 (GCP2), N-acetylated-alpha-linked acidic dipeptidase I (NAALAD1), which belongs to the peptidase M28 family and M28B subfamily. FOLH1 / PSMA is stable at pH greater than 6.5. FOLH1 / PSMA is a type II transmembrane zinc metallopeptidase that is most highly expressed in the nervous system, prostate, kidney, and small intestine. FOLH1 / GCP-2 is homodimer and binds 2 zinc ions per subunit, and required for NAALADase activity. The catalytic activity of PSMA involved in releasing of an unsubstituted, C-terminal glutamyl residue, typically from Ac-Asp-Glu or folylpoly – gamma - glutamates. FOLH1 / GCP-2 / PSMA has both folate hydrolase and N – acetylated – alpha – linked - acidic dipeptidase (NAALADase) activity and has a preference for tri-alpha-glutamate peptides. GCP-2 / PSMA involved in prostate tumor progression and also exhibits a dipeptidyl-peptidase IV type activity. In vitro, cleaves Gly-Pro-AMC. (1) Grauer L.S., et al., 1998, Cancer Res. 58:4787-4789. (2) Mesters J.R., et al., 2006, EMBO J. 25:1375-1384. (3) Barinka C., et al., 2009, J. Med. Chem. 50:3267-3273.